One '58 and it's a beauty, my first from the famous Sport Magazine All Star subset. A trio of '59s. Bill White rookie card is the highlight here. He was a fine ballplayer and beloved Yankees broadcaster for decades. Four from 1960, including Yankees star Ralph Terry. Jumping a bit to where Johnny had his big purchase, a few dozen '69s. Some big names and some high numbers here. Ditto from '71. I love the weirdly cropped Astros team card. The front: Action shot at Shea Stadium. 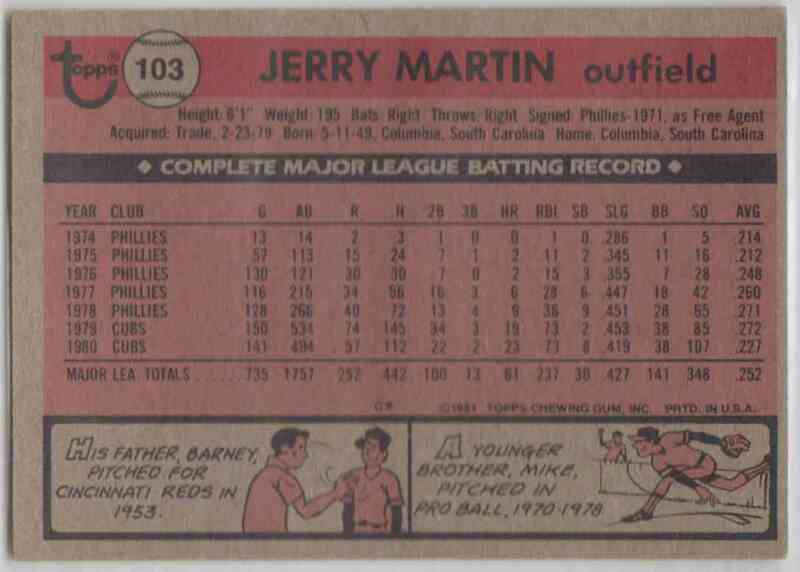 Martin was 5 for 18 with 2 home runs in five games at Shea in 1980. 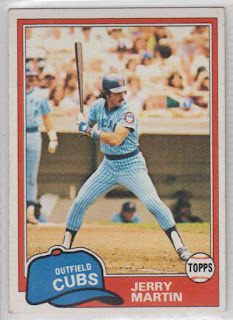 However, if the on-deck batter is Tim Blackwell, and it certainly looks like his famous mustache, than we can pinpoint this card to not just the game but the at-bat. On April 10 Martin pinch-hit for Carlos Lezcano leading off the seventh inning, doubling to left off of Craig Swan. Blackwell, Larry Biittner and Ivan DeJesus failed to move him over, however, wasting a potential scoring opportunity in the Cubs’ 5-2 loss. Martin would reach base again with one out in the ninth, but Scot Thompson, pinch-hitting for Blackwell, hit into a game-ending double play. 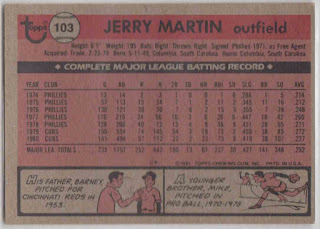 The back: Barney Martin made one big league appearance for the Reds, in 1953. Mike Martin was the fifth overall pick in the 1970 draft, by the Phillies, but never reached higher than AAA. The player: The Phillies signed Jerry as an undrafted free agent a year after drafting his brother, and three years later he was in the major leagues. In an undistinguished eleven year career, primarily as a platoon outfielder, he hit .251 with 23 HR and 207 RBI. The man: Martin was one of four KC Royals who spent the 1983-1984 off-season in jail for attempting to buy cocaine. After he was released he was signed by the Mets, whose manager Davey Johnson played with Martin in Philadelphia. After his playing career he went on to a long career as a coach. My collection: I have 18 of his cards, from 1977 to 1985. I would be interested in trading for 1982 Topps Traded #65. Infielder Brett Mandel signed with the independent Ogden Raptors in 1994 in order to write a book about the team. He appeared in four games, recording an RBI in five plate appearances. The book, Minor Players, Major Dreams, was published in 1996. He has also written Is This Heaven? 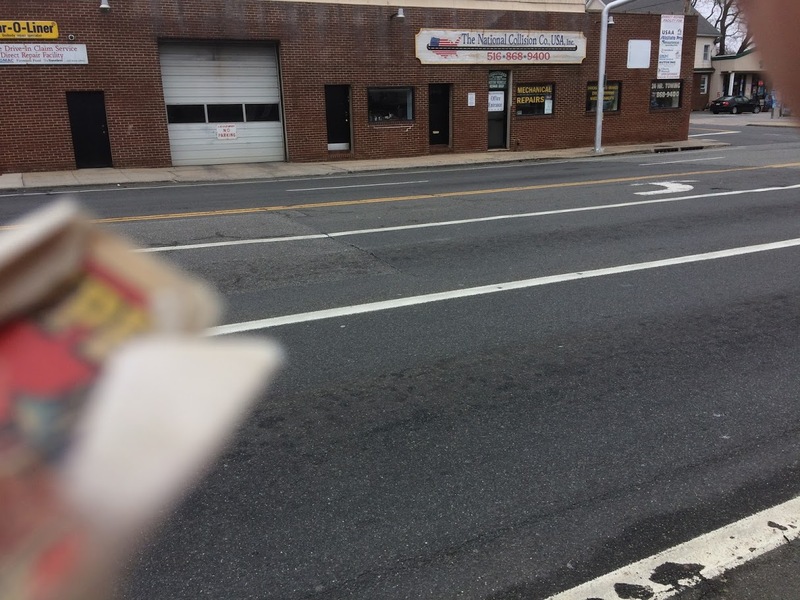 The Magic of Field of Dreams and Philadelphia: A New Urban Direction. The former Director of Financial & Policy Analysis for the City of Philadelphia, he is now an independent policy and analysis consultant. He kindly answered my questions about baseball cards. "I spent a season in the minor leagues as an author in uniform to write the book, Minor Players, Major Dreams. 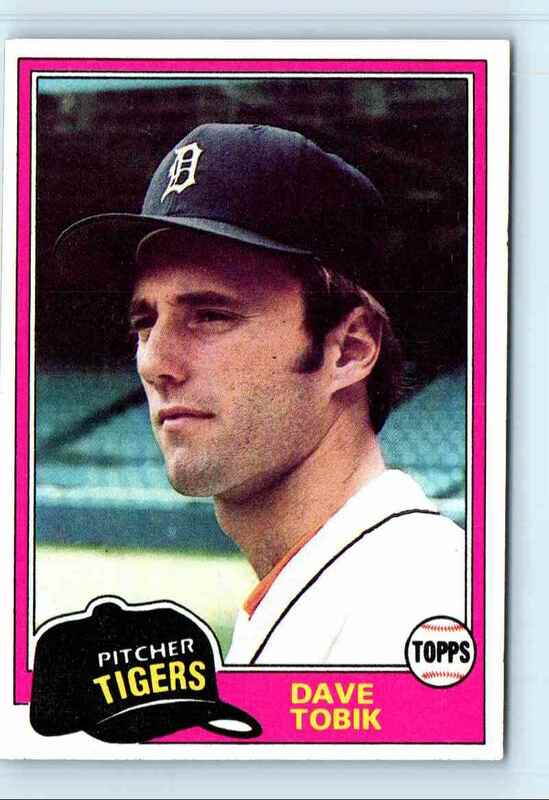 Of course, the fact that I have a real baseball card is an incredible bonus from my time in the little show. Now, 25 years later, it still brings me a regular bit of joy when an envelope comes in the mail with one of my cards in it as a request for an autograph. Many Jewish card collectors collect cards of Jewish players so my card is apparently a sought-after item for this niche group. My card — and all the other cards of the 1994 inaugural-season Ogden Raptors — is posed with a life-sized dinosaur statue. But, because the dinosaur was the real feature of the card, it is hard to even identify the players from one card to another. That makes me laugh whenever I pick it up. I have a Roy Hobbs card that was a prop for the movie The Natural and a set of cards made for the movie Bull Durham. I enjoy looking at those. I no longer collect baseball cards, but I hung on to a pile of the ones I did collect when I was 10-11 and my 13yo son has fun digging through them and mining the best ones for his growing collection." National Collision in Baldwin was known as Complete Auto Body in the 1990s when the owner's son, Joey Buttafuoco, became quite famous. 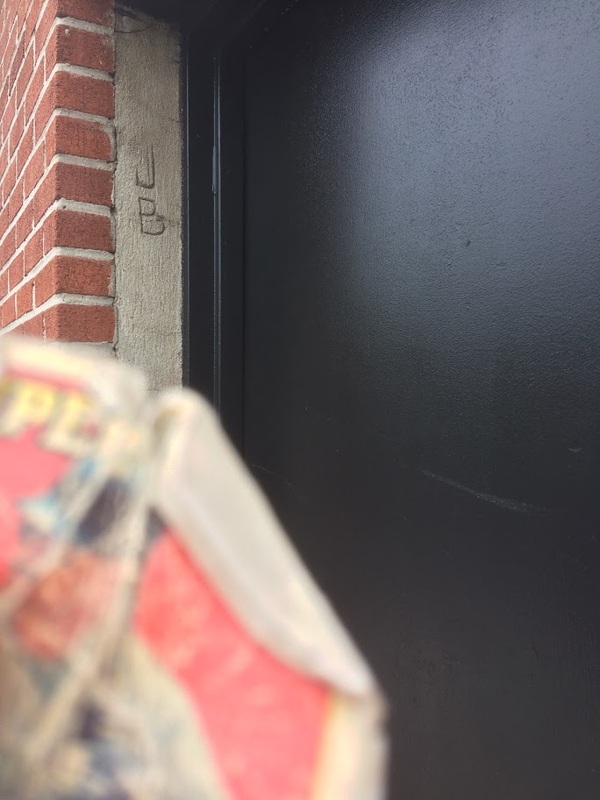 I was walking by the other day and noticed that there were initials carved into each doorway. There was CB, BB, and on the leftmost door . . . This was a local scandal for me (I lived in the same town as Amy Fisher, a close friend's mom taught with Mary Jo and had been on Joey's boat). Mostly forgotten today outside of Long Island, I would think, but it was a big enough deal at the time that three TV movies came out about it at the same time. The front: Simple headshot at an empty Tiger Stadium. 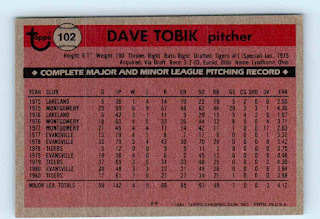 The back: When looking at his stats, I thought to myself “He must have been very popular in Evansville”. I didn’t know how right I was – he married a sportswriter for the Evansville Press, Anne Harter. 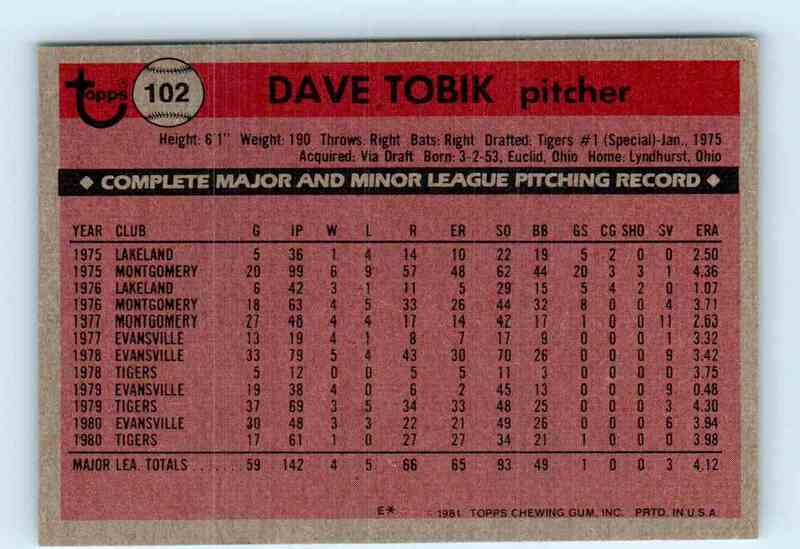 The player: Tobik was almost exclusively a reliever for the Tigers, Rangers and Mariners from 1978 to 1985. In 196 games he went 14-23 with 28 saves and a 3.70 ERA. The man: For the past 27 years he has been an account manager at FormStore, a St. Louis-based print communications company. He has also been involved in numerous charitable endeavors. My collection: I have 11 of his cards, from 1979 to 1984. I would be interested in trading for 1983 Affiliated Food Stores Texas Rangers #41.